Sure, we all know what ‘being in our heads’ implies, but I came across a statement yesterday that counter-bumped with a book I am reading. How many of you ‘believe’ that when you see it? I used to, but not any more. The counter-bump with the book opened my eyes. I came to realize that this meme might be for a certain type of people but…It is not a universal or even truthful quote. Most of the times that we are in our head enough to warrant this quote it is because of emotional concerns, worry and fear. It is not our head’s fault. It is because of ‘feel’. We feel empty, at a loss, sad, fearful, etc. I had a friend who always reminded me that there are all types of people in different communities of consciousness, seeing and speaking in different ways. We know that, right? But applying that knowing of ‘communities of consciousness’ to perspective expanding can develop incredible awareness such as knowing who the meme is for. So, what is the difference between an adept and a master, and a mahatma? And who is this statement about not being in your head for? 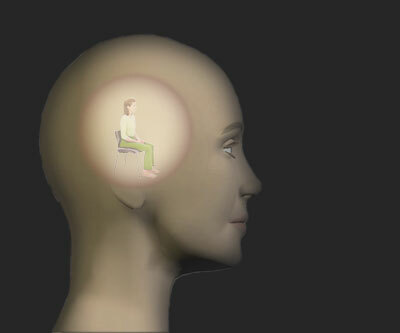 In theosophical wisdom, there is a physical body, the desire body, the thought body and the breath body, so what does the idea of “Most of us spend WAY too much time in our heads thinking and this leaves us disconnected from our bodies, our hearts, and our Spirit,” mean? If we are in our heads does it mean we are not in any of our bodies? Is there a ‘head body’? (Tongue in cheek). The statement of staying out of your head is so limiting. It could be good advice, but most often, as mentioned, those head turmoils are about emotions and not head at all. Should the truth be to stay out of our emotions? Well that is limiting as well. Others say that spiritual people have their head in the clouds. None of these statements can cover the all of the matter about what it is that interferes with an integral and aligned human experience. I can see how ‘all head’ can make people into walking lollipops but to make a statement that denies the brain and thinking in favor of all else is a tad short of wisdom. After all, we need our brain to breath, for our heart to beat and cells to do what they do. The brain needs to keep thinking. Should we not use a different approach? The statement, “Most of us spend WAY too much time in our heads thinking and this leaves us disconnected from our bodies, our hearts, and our Spirit.” is not for these three examples: adepts, masters and mahatmas, nor for many others. It is for those who are confused about where their interference is coming from. Should anyone stop thinking because the thoughts are emotional or painful? Or should they seek the source of the pain or confusion – the emotions and the memories and then ride the wave, lift the experience by redefining it? This all will require head, not a running away from the head. It might be wise to not let this meme of ‘stay out of your head’ stop you from these inner accomplishments of the many bodies in favor of quote fluff. It’s liberating to Keep Questing.